I admit to being rather proud of having created this “War of Saruman”: a variant on The War of the Ring for 3 players, one of which controls Isengard in total autonomy: Isengard, despite starting the match as ally of the Shadow, aims to seize the Ring and supremacy on Middle Earth. This variant, indeed, reflects more accurately politics and personal aims of Saruman, not coinciding with Sauron's interests. a) Isengard starts using as own 2 Shadow dice and draw customized Event cards: two decks of 10 cards each. Some of them reproduce, with the appropriate changes, those concerning Isengard originally supplied to the Shadow. The corresponding Shadow cards are removed from its decks before the game starts. Although the total number of Shadow and Isengard cards increases (a dozen cards), the ratio 2: 2 for opponents is preserved: in fact, these nations draw a single card each for turn. b) Saruman pursues its own Ring Hunting, according to rules different and more easier than those of the Shadow: the successful rolls of Isengard in the Ring Hunting never reveal nor cause harm to the Fellowship, nor benefit anyway the Shadow player. During the alliance, leader assignment, control and casualties of mixed armies of Shadow and Isengard are set taking into account their independence. As soon Isengard takes the Ring and as long as Saruman is not eliminated, Fellowship is Revealed in Orthanc (however, this does not cause it damage or provide a benefit to the Shadow): Ring-Holders are now prisoners in the fortress of Saruman (Companions must to leave). 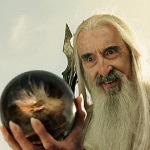 As long as Saruman is in play, no cards available to other players affect the condition of the Ring-bearers. An overall game balance is ensured by the fact that until Isengard got Ring, Isengard and Shadow will spend a lot of dice, cards and units in fighting each other. This is especially true considering the victory conditions (unchanged until Isengard and Shadow are allied). Once Isengard got the Ring, all changes: if Shadow eliminates Saruman, in the same time takes possession of the Ring and wins; if Free Peoples do, they will have to re-Hiding the Fellowship and resume the journey to Mordor. It will, from now on, be led by Gollum. Isengard, wins if in the same time is in possession of the Ring and occupies any one of the strongholds of Dol Guldur, Minas Morgul or Barad-Dur. Unfortunately the whole rulebook and the texts of the cards supplied to Isengard are for now only in Italian, and my English is bad, but I can try to cope a translation (maybe there are volunteers??) , if someone is interested especially more experienced players (I am not at all) who want to test the playability and balance. I can also make available the material (you only need to print and cut!). I'll post later a couple of pics and a brief translation of some event card of Isengard as specimen... Thank you! You can see the Board of the Saruman Hunt e two cards. Character Card: “Unholy Voices on Caradhras”. Put it on the table when the last known position of the Fellowship is a region adjacent to the western side of the Misty Mountains. Until " Unholy voices on Caradhras" is at play, Fellowship can be Declared and Revealed only in one of these regions. The Free Peoples player can force the discard of this card using an Action dice with a result "Will of the West" or with any other result and the use of an Elven Ring. Army Card: “I Know that Evil Place”. Play it if you have the Ring and are attacking a Shadow Army in Dol Guldur. Battle: Add 1 to your Combat Roll and Leader Re-Roll. Siege: in the 1st round you are successful in your Combat Roll and Leader Re-Roll even with 5. In this card, the Combat section “Cloud of crows” has been simply renamed: “Mighty is the foremost of Ishtari!”. You can see that the the upper section of "I Know that Evil Place" can’t be used against Free People.